"I may have one hunt left in me." 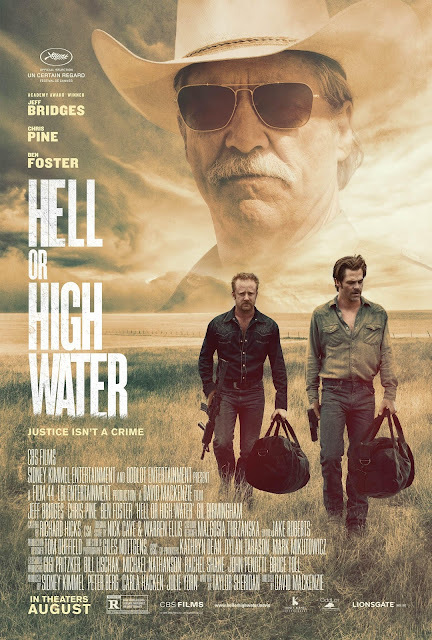 That's a great quote from Jeff Bridges in Hell or High Water, one of the 3 best films of the year so far. Bridges plays Marcus Hamilton, a Texas Ranger just days away from mandatory retirement. Hamilton, along with his partner Alberto Parker (played by Gil Birmingham), who is repeatedly teased by Hamilton for his mixed Native American/Mexican heritage, are sent to find two bank robbers in economically downtrodden Northwest Texas. The bank robbers are brothers: Toby (played by Chris Pine) & Tanner Howard (played by Ben Foster), who have robbed multiple banks in order to save their family's farm, which has been recently discovered to have oil on it. Toby wants to pay off the debt so he can leave the farm for his estranged sons. However, due to Tanner's wild nature, the bank robberies start to go awry, eventually culminating in a shootout in a desert mountain. Bridges, Pine & Foster were excellent. Bridges's performance is his best performance behind his performances in 2009's Crazy Heart & 1998's The Big Lebowski (which is my favorite film of all time). Pine's performance is his best yet, & Foster's performance is his best since his short stint on the classic HBO series Six Feet Under. The direction from David Mackenzie is excellent, along with the screenplay from Taylor Sheridan. And the cinematography from Giles Nuttgens is amazing, with absolutely breathtaking shots of the desolate Texas landscape. This is definitely one of the best films of the year so far, & I expect it to rank highly on my list of the 10 best films at the end of the year.